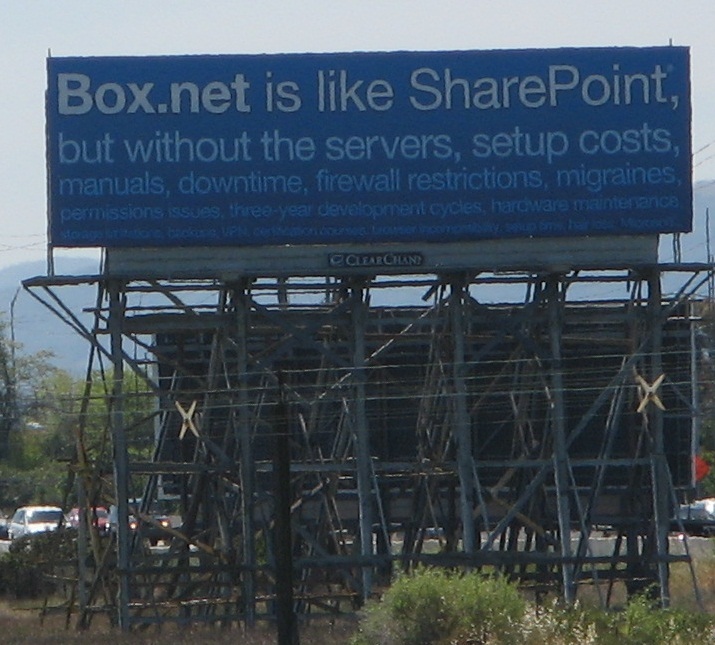 Box.net is like SharePoint but without the hassles, announces a billboard on U.S. Route 101 as it runs by Redwood Shores in Silicon Valley. The Box.net web site boasts of unleashing a SharePoint killer, a white knight in the cloud destined to slay the on-premise dragon from Redmond. Is the choice that simple? While Box.net and SharePoint both let users share files through a web interface, the products differ substantially in functionality, so much so that integrating these products may make more sense than choosing between them. Box.net is a simple tool for sharing documents in the cloud. It has low set-up costs, requires no IT infrastructure, and is accessible to users from anywhere. SharePoint’s diverse functionality reads like a Swiss Army knife: document management, web content management, records management, workflow, enterprise search, blogs, wikis, single sign-on, business intelligence, and integration with line-of-business applications. Its extensive API makes SharePoint a powerful development platform for customized enterprise solutions. With this power comes complexity, making the learning curve steep for SharePoint developers and administrators. While in certain cases Box.net may make sense as a low-cost, scaled-down alternative to SharePoint, it is apparent that SharePoint’s rich features appeal to enterprise customers. After all, these customers have made SharePoint a spectacularly successful product for Microsoft. I do not see enterprise customers giving up SharePoint any time soon, especially with the recent release of SharePoint 2010. But what if Box.net added value to SharePoint by easing the difficulty of collaborating with partners and customers? While it is certainly possible to use SharePoint itself to collaborate with external users, the configuration necessary is hardly trivial. Opening SharePoint to external users requires firewall changes, a VPN, a directory service, RADIUS, and other technologies that add cost and complexity. Besides, most users want a visibly clear distinction between internal and external content. An integration of SharePoint and Box.net could solve this problem through the implementation of a just a few use cases: publishing of SharePoint documents to Box.net, viewing Box.net documents from within a SharePoint site, comparing the differences between internal and external versions, and synchronizing versions. While it may make sense for Box.net to ride the cloud-computing hype and position itself as a SharePoint killer, enterprise customers need more choices, not false choices. Enterprise IT must decide what to migrate to the cloud and what to keep in the data center, balancing the hoped for savings and agility of cloud computing with the concerns for security and stability. Instead of promoting an either-or proposition, cloud vendors like Box.net should provide tools that bridge the data center and the cloud, enabling customers to adjust the balance to their requirements.